Notes: The Buzz Hackle is a Fore and Aft pattern similar to the Sierra Bright Dot and the Grey Ugly. It was designed by Myrtle Powell in the 1920's at their flyshop in Marysville, CA. Mrytle was the wife of famed bamboo rod builder, E. C. Powell, and an accomplished fly tier. Mr Al Lent, a friend of the Powells, requested an attractor dry fly that would consist of both Brown and Grizzly Hackle. He also wanted to utilize peacock herl. Myrtle came up with this pattern and it immediately found the desired results within the waters of the Yuba River Drainage. Mr Lent's son, "Buzz" was to pass away a few years later and the fly was named in his Honour. Clyde Powell, Mrytle's son, continued to tie the pattern which extended it's popularity. Note that the Aft Hackle is one size larger than the Fore Hackle. This is the opposite of the Sierra Bright Dot and Gray Ugly as the Aft Hackle on these flies are always one size smaller. By keeping the larger hackle in aft, the hackle helps support the extra weight of the hook curve so that the fly floats more evenly on the water. 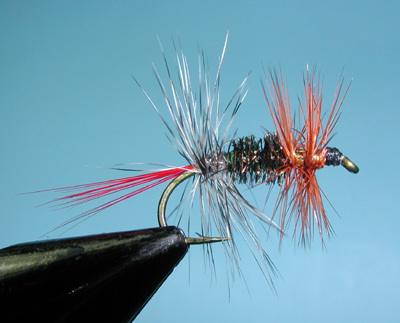 As with the Gray Ugly, the Buzz Hackle can also be tied onto a heavier wet fly hook and used subsurface. Thomas C. Duncan Sr. provided most of the information on the Buzz Hackle as it was passed down to him from his Grandfather who fished the Yuba River and neighboring streams. Thomas is an accomplished fly tier and resides in Northern California as a Pastor. I have also found references to the Buzz Hackle in Ed Klingelhofer's book, "Fly-fishing California's North Yuba River" and Louis Bignami/Denis Peirce book, "North Tahoe Trout". Trent Pridemore in his article, "Trout Flies Unique to California" (California Fly Fisher July/Aug 2008) wrote that a version of this fly was popular around Lake Davis during the early 1970's. Evelyn Gamble of Portola tied a version of the Buzz Hackle in which the tail was a mix of Grizzly and Brown hackle fibers. The entire body was also palmered with the two hackles , thus it was no longer a Fore and Aft pattern. It was fished as a dry on the South Fork of the Feather and as a wet fly on Lake Davis when stripped just under the surface during the late evening.